25 years experience caring for the elderly. Abbey Care Services can provide pliative care. 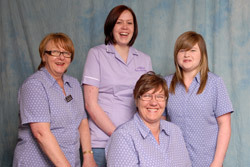 Abbey Care Services, based in Kirriemuir, is dedicated to providing the highest level of home care throughout Scotland. Manager, Jillian Faloon has over 25 years experience in the provision of care for the elderly. She and her team are committed to providing the kind of 24-hour care which helps people to retain their independence and remain in their own homes. They also provide care for adults with physical disabilities, mental health issues and learning difficulties. They do not use agency staff. All carers are employees, giving clients the continuity of a dedicated carer who gets to know them very well. Whether you need short-term help while you recover from hospital treatment or longer-term care, rely on Abbey Care Services to do what’s right for you. We can now offer you respite or permanent placement in our 14 bed residential home, Abbey house is situated just outside Kirriemuir in the beautiful Angus countryside. "Abbey Care Services – with you at home."